My Mom has been traveling most of August. Her latest trip was with my brother to London. That's as in England! It was her first trip there and his one of many. She said her first experience was going through immigration when the man referred to her as my brother's Mum. Otherwise she was pretty much known in London and England as Madam. I never think of my Mom in terms of either Mum or Madam! What did my Mum enjoy most about the trip? Cemeteries, cemeteries, cemeteries! She doesn't seem to deviate. She would walk miles to get to a cemetery. 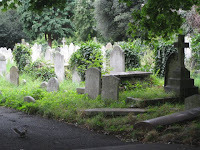 The first she visited was Highgate Cemetery (west) where she took a tour. She had walked a long ways to get there and soon realized the tour would be a breeze. The elderly man guiding them was slightly overweight and winded, giving her adequate time to snap photographs. On her trip to Salisbury and Stonehenge she said the coach would not stop at all the quaint Norman churches so she could walk the cemeteries. That means Mum will have to go back some day. She said the best part of visiting St. Paul's Cathedral and Westminsters Abbey was exploring the crypts. That's my Mum! The day before she left to fly home, she informed my brother that she was taking her own personal tour by herself in the Brompton Cemetery. Off she went on the tube in search ofa cemetery. Mom was snapping a photograph of tombstones when a man approached her saying to not trip over the squirrels. there were squirrels around her feet in search of food. I am sure she is still dreaming of London, riding the tube, old cemeteries and crypts and trying to calculate how long she has to wait for trip number two. That's my Mum!